Condition is New, never opened. Brand NEW Apple iPad mini 4 128GB, Wi-Fi, 7.9in - Space Gray (FREE SHIPPING). Condition is New. Shipped with USPS Priority Mail. NEW SEALED Apple iPad mini 4 WiFi 128GB - Gold/ Silver/ Space Gray US Seller! SPACE GRAY (BACK SIDE)/BLACK (FRONT SIDE) (WIFI ONLY). Touch ID fingerprint sensor. NOT REFURBISHED, NOT OPEN BOX, NOT USED! MODEL MK9N2LL/A. Two speaker audio. Touch ID fingerprint sensor. SILVER (BACK SIDE)/WHITE (FRONT SIDE) (WIFI ONLY). Two speaker audio. MODEL MK9P2LL/A. A8 second-generation chip with 64-bit desktop-class architecture. Up to 10 hours of battery life. Condition is New. The 128GB iPad mini 4 from Apple has a smaller form factor than its big brother, the iPad Air 2. The iPad mini 4 is just 6.1mm thin and weighs 0.65 lb. Its smaller form factor makes it easier to hold in one hand. IPad mini 4 Wi-Fi 128GB. iPad mini 4. ™ and © 2014 Apple Inc. Apple iOS 9. Touch ID fingerprint sensor. Total Storage Capacity. Apple iPad mini 4. Space Gray. Condition is New. Technical specifications for APPLE iPad mini 4 - 128 GB, Space Grey. Notification Centre. Enjoy a full iPad experience in the palm of your hand with the new and improved AppleiPad mini 4. Apple Space Gray 128GB iPad mini 4 (Wi-Fi Only) - MK9N2LLA. iPad mini 4 uses Touch ID technology to turn your fingerprint into the perfect unforgettable password. iPad mini 4 puts everything you love about iPad into an incredibly sleek and portable design. 32GB Capacity, Wi-Fi (802.11a, b, g, n, ac) MIMO Bluetooth 4.2; Up to 10 Hours of Battery Life, 0.65 lbs. With one year Apple manufacturer warranty. Apple iOS 9, Dual-Core A8 Chip with Quad-Core Graphics. ITEM: Apple iPad mini 4 128GB Wi-Fi 7.9in - Silver. STYLE NUMBER We have been a. With apple 1 year warranty! CPU Apple Dual-Core. 1x 1/8" (3.5 mm) Headphone. Focus Type Contrast-Detect Autofocus. AK, HI, PR, VI, MP, PO BOX, APO, FPO. Storage Flash 128 GB. Weight 0.65 lb /. 29 kg. Audio Integrated Stereo Speakers. Apple iPad mini 4 128GB, Wi-Fi, 7.9in - Gold. Condition is New. Shipped with USPS Priority Mail. Brand new. Open to check and never turn on. Apple iPad mini 4 (16GB, Wi-Fi Cellular, Gold). Apple iPad mini 4 128GB, Wi-Fi, 7.9in - Space Gray (CA). Condition is new and sealed in box. 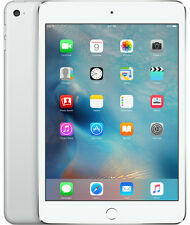 Apple iPad mini 4 Wi-Fi 128GB Silver. Apple iPad mini 4. iPad mini 4, Lightning to USB Cable, USB Power Adapter. Up to 10 hours of surﬁng the web on Wi‑Fi, watching video, or listening to music; Up to 9 hours of surﬁng the web using cellular data network. Apple iPad mini 4 Wi-Fi 128GB MK9N2LL/A -Space Gray. iPad mini 4. Touch ID fingerprint sensor. Two speaker audio. Up to 10 hours of battery life. Apple iPad mini 4 128GB, Wi-Fi Cellular (Unlocked), 7.9in - Space Gray. Condition is New. Shipped with USPS Priority Mail. Ipad Mini 4 128GB wifi. Space Gray. 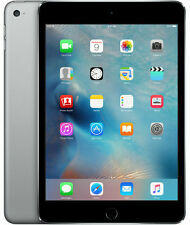 Apple iPad mini 4 128GB, Wi-Fi, 7.9in - Silver. Condition is New. Shipped with USPS Priority Mail. I PAD MINI 4 WI FI 128GB SPACE GREY. NewApple iPad mini 4 16GB, Wi-Fi, 7.9in - GOLD (Latest Model). iPad mini 4 16GB (gold). iPad mini 4. A8 second-generation chip. A8 chip with 64‑bit architecture. NOT Refurbished,NOT DISPLAY MODEL. Fully laminated display. NEW - Apple iPad mini 4 128GB, Wi-Fi, 7.9in - Gold - Free Expedited shipping!! New Sealed - Apple - iPad mini 4 Wi-Fi 128GB - Gold. Two speaker audio. 802.11n Wi-Fi with MIMO. Apple iPad mini 4 128GB, Wi-Fi, 7.9in - Space Gray - Brand New. Condition is New. Shipped with USPS Priority Mail. The128GB iPad mini 4 fromApple has a smaller form factor than its big brother, the iPad Air 2. The iPad mini 4 is just 6.1mm thin and weighs 0.65 lb. Its smaller form factor makes it easier to hold in one hand. Apple iPad mini 4 Wi-Fi 128GB MK9Q2LL/A -Gold. iPad mini 4. Two speaker audio. Lightning to USB Cable. A8 second-generation chip. What's In The Box. Touch ID fingerprint sensor. Up to 10 hours of battery life. NewApple iPad mini 4 128GB, Wi-Fi, 7.9in - Gold (Latest Model). iPad mini 4 uses Touch ID technology to turn your fingerprint into the perfect unforgettable password. iPad mini 4 puts everything you love about iPad into an incredibly sleek and portable design. 128GB Capacity, Wi-Fi (802.11a/​b/​g/​n/​ac) MIMO Bluetooth 4.2. Apple iPad mini 4. A8 second-generation chip with 64-bit architecture. 1.2MP photos. 8MP photos. 1080p HD video recording. Wi‑Fi (802.11a/​b/​g/​n/​ac); dual channel (2.4GHz and 5GHz). Apple iPad mini 4 32GB, Wi-Fi, 7.9in - Silver ( MNY22LL/A ). Lithium Ion. Technical Specifications: Go to apple website for a complete set. Touch ID fingerprint sensor. Sealed in Factory Box . Two speaker audio. This is UK edition with UK accessories with UK warrenty. Can show John Lewis receipt if required. Apple iPad mini 4 32GB, Wi-Fi, 7.9in - Space Gray ( MNY12LL/A ). Technical Specifications: Go to apple website for a complete set. Apple iOS 10. Touch ID fingerprint sensor. Sealed in Factory Box . Two speaker audio. Touch ID fingerprint sensor. Up to 10 hours of battery life. 802.11ac Wi-Fi with MIMO. Touch ID fingerprint sensor. Up to 10 hours of battery life. 802.11nWi-Fi with MIMO.